Virginia is the leading data center market in the world, supported by its strong internet infrastructure that helps data centers thrive. It is believed that roughly 70 percent of the world’s internet traffic runs through Virginia, and with continued investments to support incredible internet infrastructure growth in the state, Virginia will continue to remain at the epicenter. This is due, in large part, to the high-density fiber optic cable networks that run throughout the state. Data centers require reliable, fast, and redundant connectivity – and this need is met in Virginia, including Southern Virginia. 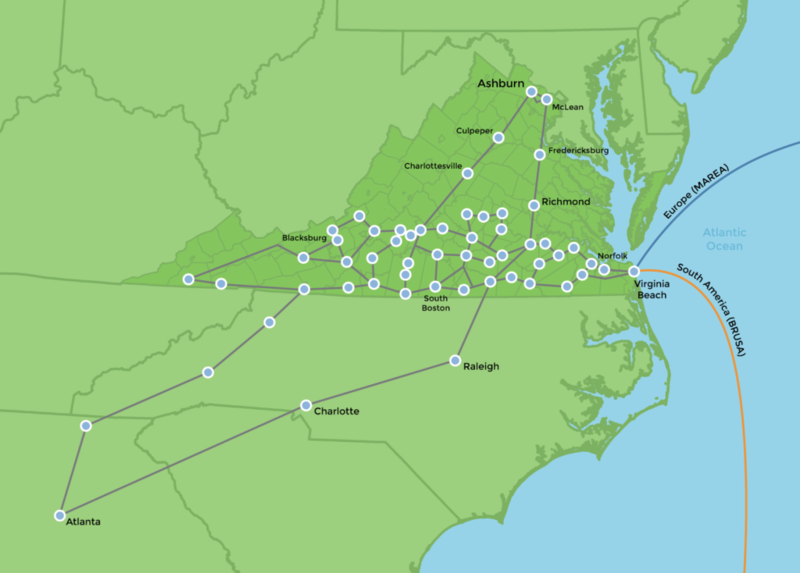 Southern Virginia is highly connected by high-density fiber that runs across the region via Mid-Atlantic Broadband Communities Corporation’s (MBC) advanced fiber-optic broadband network. MBC’s expansive network spans 1,800 miles across the region and includes long-haul optical transport routes to key peering hubs on the East Coast, including Ashburn, Atlanta, Charlotte, Raleigh, and New York. The MBC network also offers direct connections to Europe and South America through the two subsea landing stations based in Virginia Beach. MBC’s terabit network is powered by the industry’s best-in-class packet-optical transport network architecture, which enables data centers to benefit from low latency, 100G connections. In addition to offering robust optical transport services on its network, MBC provides colocation and tower leasing to retail telecommunication service providers. Leveraging MBC’s robust and scalable advanced fiber-optic broadband network and its prime location in the heart of the world’s data center market, SOVA is well-equipped to support data center companies and their growing needs. As data center capacity requirements become more sophisticated and transport needs grow, a highly connected network with speed and reliability is increasingly critical. MBC’s backbone network architecture can deliver 100G services and is designed to support terabit capacity as needed. MBC uses packet optical networking solutions designed by Infinera, the only supplier platforms delivering 500G of transmission capacity based on photonic integration circuits. MBC can deliver 500G on a single line and scale up to 12T of optical transport network switching, providing seamless expansion to the network as traffic requirements grow. MBC’s network is designed to protect itself against network failures – should the network go down, MBC’s 24/7 operations center can re-route traffic immediately, avoiding disruption to its customers, an essential failsafe for data centers who rely on reliable service. SOVA’s strong fiber infrastructure, atop power, water, sewer and transportation, combined with a technically skilled workforce and available sites make the region the ideal location for data centers. Microsoft chose Mecklenburg County in Southern Virginia for a major data center site in 2010 and has invested nearly $2 billion in that location to-date. Microsoft cites access to fiber infrastructure as a primary incentive to locate and expand in SOVA.